Murdoch: "The current days of the Internet will soon be over"
(CNN) -- Media tycoon Rupert Murdoch expects News Corporation-owned newspaper Web sites to start charging users for access within a year in a move which analysts say could radically shake-up the culture of freely available content. Murdoch said the existing Internet business model was "malfunctioning." Speaking on a conference call as News Corporation announced a 47 percent slide in quarterly profits to $755 million, Murdoch said the current free access business model favored by most content providers was flawed. "We are now in the midst of an epochal debate over the value of content and it is clear to many newspapers that the current model is malfunctioning," the News Corp. Chairman and CEO said. "We have been at the forefront of that debate and you can confidently presume that we are leading the way in finding a model that maximizes revenues in return for our shareholders... The current days of the Internet will soon be over." He said 360,000 people had downloaded an iPhone WSJ application in three weeks. Users would soon be made to pay "handsomely" for accessing WSJ content, he added. 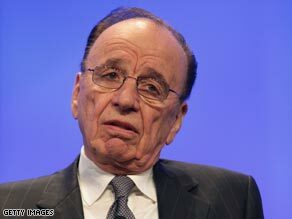 Murdoch said he envisaged other News Corp. titles introducing charges within 12 months. Murdoch's international newspaper empire includes the New York Post, the News International stable of UK titles including the Sun and the Times, and a cluster of Australian papers including the Daily Telegraph and the Herald Sun. His comments come with the U.S. newspaper industry in a state of crisis amid plunging advertising revenues and falling circulations with several historic titles already going out of business. Joshua Benton, Director of the Nieman Journalism Lab at Harvard University, said Murdoch was not the only executive looking to generate new income streams from online content. "News executives are starting to recognize that online advertising revenues are not enough on their own," Benton told CNN. But he said the challenge for media organizations was finding a balance between advertising and subscription revenues and figuring out how to charge for content without alienating existing users -- which could lead to Web sites offering tiered levels of free and paid-for material. "I suspect within any readership there is a small slice -- maybe three percent -- that is willing to pay. News organizations are going to have to find a way of getting money from that slice without driving away everybody else," Benton said. "I don't think you can afford to put a lock and chain on the front page. Benton said the U.S. newspaper industry was in a "horrible state" which was likely to get worse. "We're starting to see holes where newspapers were. The question is, will new Web sites fill the holes, will traditional names come in -- or will they just not get filled?" The paper's owners, The New York Times Co., postponed plans to close the paper after reaching a deal with six of seven employees' unions but said the Globe was expected to lose $85 million in 2009 if it did not make major cuts. The developments followed the demise of print editions of The Rocky Mountain News in Denver, Colorado; The Seattle Post-Intelligencer; and The Christian Science Monitor. The Rocky Mountain News shut down completely; both the Seattle paper and the Christian Science Monitor remain in online editions. At least 120 newspapers in the U.S. have shut down since January 2008, according to Paper Cuts, a Web site tracking the newspaper industry. More than 21,000 jobs at 67 newspapers have vaporized in that time, according to the site. Despite the general mood of gloom over the state of the economy, Murdoch said he believed the worst of the financial crisis had passed. "I'm not an economist and we all know economists were created to make weather forecasters look good," he said. "But it is increasingly clear the worst is over."